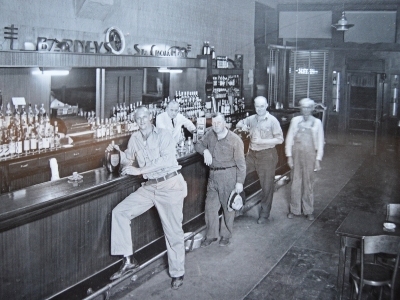 In 2003, Kevin Dunne and Randy Rodgers took over the former Johnny’s Bar, added some windows and a kitchen, and transformed it into the downtown Stillwater treasure, Whitey’s Bar. Adding their signature and affordable gourmet food (served ’til 11:00 PM every night! ), excellent weekend breakfast, unbeatable food and drink Happy Hour, incredible service (and Pull Tabs from the Eagles Club too! 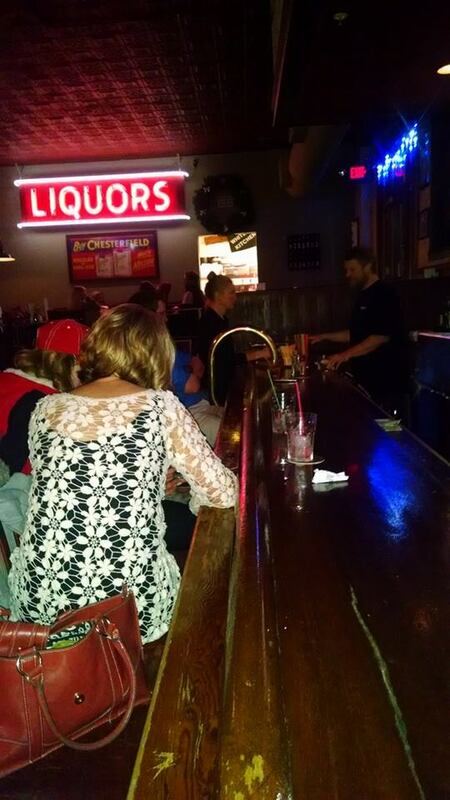 ), Whitey’s Stillwater is the place to be for locals and visitors alike. Slow cooked pork shanks covered in spicy hoisin glaze, garnished with pickled vegetables. Grilled chicken, spinach, tomatoes, green onions, and cheese grilled in a flour tortilla served with house made salsa and sour cream. Black beans, spinach, tomatoes, green onions, and cheese grilled in a flour tortilla served with house made salsa and sour cream. Spicy slow roasted pork and melted cheese on corn tortillas served with chipotle sour cream. House made minced jalapenos and cream cheese stuffed wontons served with Chinese dipping sauce. Slow roasted pork sandwiches topped with pepper cheese on sour dough mini buns. Tempura battered calamari rings served with sesame ginger and aioli sauces. Maryland Blue Crab mixed with spices and seasoned bread crumbs served with Dijon mayonnaise. A warm wheel of Brie served with toasted baguette and red grapes. Fresh olive tapenade and house made hummus served with warm pita bread. Artichoke, crab, two cheeses, and spices served with toasted baguette. House made tortilla chips topped with two cheeses, green onions and tomatoes served with our house made chili. Strips of fresh walleye deep-fried house made batter served with aioli. House made tortilla chips served with fresh salsa. Sautéed asparagus covered in spicy Szechuan sauce topped with sesame seeds. Cherry wood smoked salmon with lemon caper cream cheese, served with lavash. Beef tenderloin medallion marinated in Japanese spices broiled and sliced thin. Served rare. Yellow fin tuna marinated in Japanese spices broiled and sliced thin. Served medium rare. Slow roasted for twelve hours in wine, garlic, and spices served au jus on a sourdough bun with mild peppers. Slow roasted pork smothered in house made spicy BBQ sauce served on a sour dough bun. Portabello, red onion, lettuce, roasted red peppers and balsamic vinaigrette. Served on a sour dough bun. Lean pastrami and pepper jack cheese grilled on dark rye toast and served with aioli. Yellow Fin Tuna steak grilled and served on your choice of white, wheat, or dark rye with lettuce, onion, tomato and aioli. Try it with Cajun spices! Roasted pork tossed in Vietnamese BBQ sauce topped pickled vegetables on a hoagie with sriracha mayonnaise. Shredded slow roasted pork with ham, swiss, pickles, and mustard on pressed French bread. One-half pound burger with carmelized onions, swiss cheese, on dark rye. One-half pound burger char-broiled with your choice of cheddar, swiss, or pepper jack cheese. Fresh lean ground turkey char-broiled with your choice of cheddar, Swiss, pepper jack cheese. Thinly sliced grilled tenderloin served on a hoagie with fried onions and horseradish sauce. Pepper jack, swiss, and cheddar triple decked with bacon and tomato on white, wheat, or dark rye. Grilled tuna salad served with your choice of pepper jack, swiss, or cheddar on white, wheat, or dark rye. Corned beef or turkey grilled with sauerkraut and 1,000 Island dressing on dark rye toast. Marinated grilled chicken breast served on a hoagie with your choice of cheese. Try it with Cajun spices! Marinated chicken breast served on a hoagie with pepper jack, BBQ sauce, and bacon. Our meatloaf served on your choice of white,wheat, or dark rye bread served cold with house made ketchup. Deep-fried walleye in house made batter served on a hoagie with lettuce, tomato and aioli. Grilled Italia sausage, smothered in marinara with onions, peppers, and mozzarella. Thick sliced bacon, lettuce, and tomato on your choice of white, wheat, or dark rye toast with mayo. Bacon, lettuce, tomato, turkey, and cheddar on your choice of white, wheat, or dark rye toast with mayo. All sandwiches served with choice of fries, tater tots, fresh fruit, or cole slaw. Substitute a cup of soup or chili – $1.95. Substitute a side salad – $2.95. House-made dressings: French, Ranch, Blue Cheese or Caper Vinaigrette. Chopped romaine lettuce and croutons tossed in house-made Caesar dressing. Grilled chicken, hard-boiled egg, chopped bacon, green onions, avocado, blue cheese, and tomatoes served on a bed of mixed greens with your choice of dressing. Mixed greens tossed in southwestern dressing topped with grilled chicken or sirloin with sauteed onions, peppers, shredded cheese, and tomato wedges. Mixed greens tossed in garlic vinaigrette with artichoke hearts, kalamata olives and feta cheese topped with grilled chicken breast, tomato wedges and red onions. Mixed greens tossed in house-made caper vinaigrette topped with grilled sirloin, tomato wedges and red onion. Mixed greens tossed in Asian dressing with mandarin oranges, rice noodles, and glazed chicken strips. Mixed greens, tomato wedges, yellow onions and croutons with your choice of dressing. Three corn tortillas stuffed with seasoned chicken and green chilies topped with ranchero sauce, melted cheese, sour cream, and green onions. House made meatloaf served with garlic mashed potatoes and gravy. Black beans, Pico de Gallo, rice, and melted cheese stuffed in a flour tortilla topped with salsa and served with sour cream and guacamole. Sliced Italian sausage tossed in marinara, onions, peppers, and cavatappi pasta then baked with mozzarella. Marinated chicken skewered with fresh vegetables grilled and served on dirty rice with tahini ginger sauce. Twelve ounce grilled Cajun pork chop served with dirty rice and broccoli. Six ounce bacon wrapped filet served with garlic mashed potatoes and broccoli. Choice of broiled, sauteed, or deep-fried walleye filet served with garlic mashed potatoes and broccoli. Slow cooked in our kitchen with house BBQ sauce served with coleslaw and fries. Macaroni noodles smothered in our rich cheese sauce topped with toasted bread crumbs. Pepper cheese, hot sauce, on a hoagie with blue cheese dressing. Turkey, bacon, swiss, lettuce, tomato, mayo in a flour tortila. Burger, cheddar, thousand island dressing, pickle slices, and onions on grilled wheat. Steak or Chicken, fried onion and peppers, spring mix, southwest dressing in a tortilla. Monday through Thursday choice of fries, tots, slaw, or fruit. Fish, lettuce, tomato, onion, cheese, pico in flour tortillas. Friday served with dirty rice. Two eggs, any style, toast or English muffin, and choice of potato. Served with a Bloody Mary, screwdriver or greyhound. Three eggs scrambled with red peppers, onions, sausage, and potatoes topped with melted cheese and served with toast or English muffin. A classic preparation of two poached eggs and Canadian bacon served on an English muffin and smothered in our house made Hollandaise sauce. Two poached eggs, sauteed spinach and crab meat served on an English muffin and smothered in our house made Hollandaise sauce. Six ounce sirloin served with two eggs any style, choice of potato, and toast or an English muffin. Two eggs any style served with choice of potato, ham, bacon, sausage or Canadian bacon and toast or English muffin. House made corned beef hash served with two eggs any style and toast or English muffin. Combination of scrambled eggs, bacon, and cheese piled high on a croissant. Served with our house made Hollandaise sauce. Two eggs over easy, hash browns, and green chili sauce served on a flour tortilla then topped with melted cheese and Pico de Gallo. Served with toast or an English muffin. Two eggs any style served with buttermilk biscuits and sausage country gravy. Fresh seasonal fruit served with yogurt and cottage cheese. Sauteed spinach, Greek olives, and feta cheese served with choice of potato and toast or an English muffin. Whitey’s favorite! Your choice of chicken or steak with Pico de Gallo and pepper cheese served with choice of potato and toast or English muffin. Let your imagination run wild. Each additional item $.80. Served with choice of potato and toast or an English muffin. Chose from: Mushrooms, Onions, Tomatoes, Green Peppers, Kalamata Olives, Ham, Bacon, Sausage, Canadian Bacon, Spinach, Jalapenos, Feta Cheese, Cheddar Cheese, Pepper Cheese, Swiss Cheese. Three pieces of French bread stuffed with cream cheese and strawberries, dipped in our batter and lightly grilled. Topped with powdered sugar. Four pieces of French bread dipped in our batter and lightly grilled. Topped with powdered sugar. Two buttermilk pancakes served with maple syrup. Two pancakes prepared specifically by our chef. Ask your server. Whitey’s does not take personal checks. Choice of Slow Roasted Beef, Pork Carnitas, or BBQ Pork. Sauteed asparagus covered in spicy Szechuan sauce. House made served with pita bread. Slow cooked pork shanks glazed with garlic hoisin sauce and pickled vegetables. French baked bread brushed with jalapeno garlic butter, covered with our blend of cheeses and served with our house made marinara. Creamy and spicy buffalo chicken dip topped with cheese and chives. Served with tortilla chips and celery. Thin cut fries topped with our homemade chili and covered in melted cheese. $4.00 Taps – 16 oz. $2.75 Miller Lite Taps – 16 oz. Excellent walleye sandwich and breakfast this morning was bomb!!! Staff so friendly and attentive. Great food, chill atmosphere and friendly service. Loved it! Just one dang great meal… and the hospitality made feel so at home. Love the fresh squeezed juice! The breakfasts are great, love the Cuban sandwich. Great staff, will definitely keep going back.